This post has been a long time coming but I finally feel I have a brush for just about every purpose that I completely love. There have been some tough decisions but I've whittled it down to those brushes that I could happily just use exclusively for the rest of my life! If you're planning a Sephora order then I wholeheartedly recommend adding this to your basket. I wasn't sure what to expect after picking it up on a whim because I'd heard good things about Sephora's own brand brushes and this seemed to have great reviews. It has loose, synthetics bristles which mean it could also be really great for powder, however I love it for bases. For any more fluid, light base then this is perfect. I much prefer it to using my fingers or a Beautyblender. It just blends out lighter formulas perfectly with no brush strokes and gives the most natural, skin-like finish. 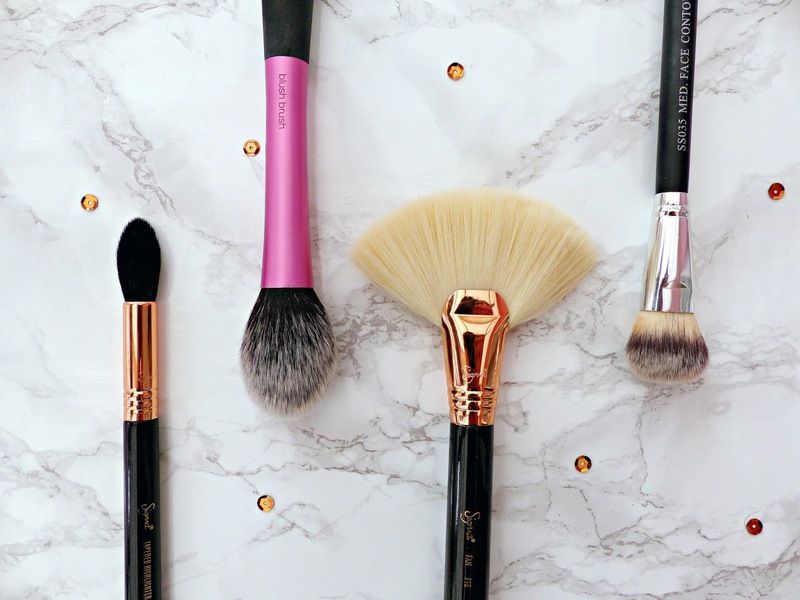 This is definitely one of my all-time most used makeup brushes! It's a synthetic brush with rounded, dense bristles. Mine is from the Rose Golden set so of course it has the beautiful copper-toned finish. It's my go-to for any medium coverage bases like Nars Sheer Glow as it just applies my base flawlessly. If I want that next-level flawlessness then I reach for this flat-topped brush. Again the bristles are synthetic (always my preference for liquid/cream formulas and for face brushes) and these are packed in even more tightly, which really helps give that airbrushed look. When I want a full coverage, seamless base then I use this with something like Estee Lauder's Double Wear. I know this is a setting brush (and I do have another one I sometimes set my under-eye concealer with) but I love it for applying concealer under my eyes. It just seems to blend everything out so seamlessly and naturally! It has quite dense, synthetic bristles that seem to just really work with concealers. I often go over it with a damp Beautyblender afterwards to ensure it's all blended in properly but it applies the product really well in the first instance. This is my go-to brush for applying concealer to blemishes. The synthetic bristles are very dense and slightly rounded, which also makes it perfect for getting into every little crevice of your face (like into the corner of the eyes and round the sides of the nose). The size of the brush is very small too, which makes it great for concealing specific areas. I feel like this buffs the product in perfectly to help it blend in with my foundation. When I first got this brush there were almost too many options as to what to do with it! However I've realised that I do really just like it as a powder brush. Again the bristles are synthetic and fairly loosely packed. It has a tapered shape which means you can use it to set underneath your eyes too. It's perfect for a nice, light little dusting of powder without disturbing the makeup underneath. It was a tough decision but I do think that when it comes down to it: this is my #1 highlighting brush. It's just the perfect shape, the bristles (synthetic and with technology unique to Sigma) are so silky-smooth and pick up the right about of product then blend it out seamlessly. I also love that it's really hard to go overboard with this because unless you seriously load up the brush, it gives a nice and subtle application. This is one of those brushes that I just know is going to apply powder products perfectly. If this can't do it then nothing will and the blusher is probably just rubbish! The shape doesn't look like it should work but somehow it does. It's surprisingly large with rounded synthetic bristles. I use the very tip to apply blusher then angle it to blend things out. It also works beautifully for subtle bronzing. I was never really one for cream contouring until I discovered this - it really has been a game-changer! The slightly rounded synthetic bristles fit perfectly into the hollows of my cheeks. It makes it so easy to apply and blend out cream contouring and bronzing products (like my ColourPop bronzers) for a really natural look. I must admit, I was slightly perplexed when I read online that this was an amazing contour brush but it honestly does work! All you have to do is angle it into the hollows of your cheekbones, do a couple of swipes and you have a sharp, flawless contour. It works with all of my favourite powder formulas too. Again the bristles are synthetic and made with Sigma's exclusive technology. It really is a beautiful brush and the bristles are so thick and soft. It's a bit of an investment but it works and has a really luxurious feel to it. I actually don't use this for blending! It does work really well as a more precise crease brush but personally I find it perfect (and the only brush I ever use) for applying a highlight shade. It has very tapered, precise bristles (again made with Sigma's synthetic fibres) that means it seems to fit perfectly in my inner corner to pat on my highlight. I'm really annoyed this isn't available individually but such is my commitment to this brush that I'd consider buying the whole eye set if I needed to repurchase it! I actually got this as part of a limited edition collection over a year ago and have quite possibly used it every day since. It has synthetic bristles again, which are fluffy and very slightly tapered. It's just perfect for quick and easy application of an all-over lid shade like MAC's All That Glitters. I actually had one from Crownbrush I used to use for the exact same thing but it was discontinued and I had to kind of stop talking about it! Luckily I discovered another that I like just as much. This a pointed crease brush with synthetic bristles that is still quite large so although you might think it would be more for precise look, I actually love it for softly applying a transition shade. I like this more than the MAC 217. There. I said it! And at less than half the price it's a good job because I honestly own about 4 of these. It has almost the same slightly rounded natural bristles as the 217 and I actually have a comparison of them here if you were interested. Anyway, I just find this to be the perfect do-it-all brush; if you're travelling then this is virtually all you need! It can apply your base shade, a soft crease colour and then blend it all in. This is in the running for my all-time favourite eyeshadow brush! It's a small, tapered brush with natural bristles that fits perfectly in the crease. It's just amazing for precisely applying and then blending out a dark crease colour. I honestly don't know how I did anything vaguely-resembling a smoky eye before I got my hands on this! It's a flat, firm brush with natural bristles that's just perfect for patting a dark shade onto the outer part of your eyelid. It's also great for blending it in with everything else and even for taking the shade underneath the eyes to line them a little. 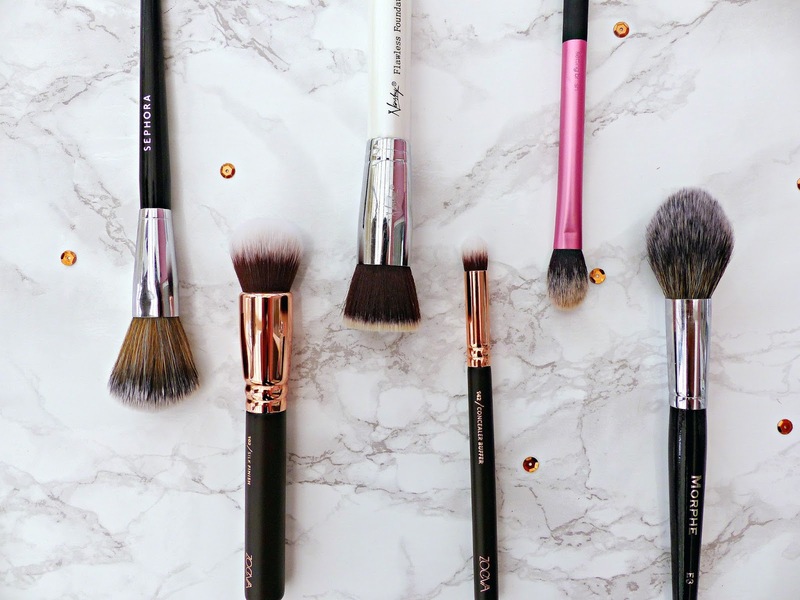 What are your all-time favourite makeup brushes? *DISCLOSURE - PRODUCTS MARKED WITH AN ASTERISK ARE PR SAMPLES/GIFTS. I AM A SIGMA AFFILIATE. ALL OPINIONS ARE MY OWN. PLEASE VISIT MY DISCLOSURE PAGE FOR MORE INFORMATION. Really helpful post! I love your pictures as well. Real techniques brushes are such a good quality for their price I think, same for zoeva brushes! Love this list, I've been wanting some new brushes for a while so I might have to invest in some of these. I love the look of the Nanshy flat top brush and the fan one. 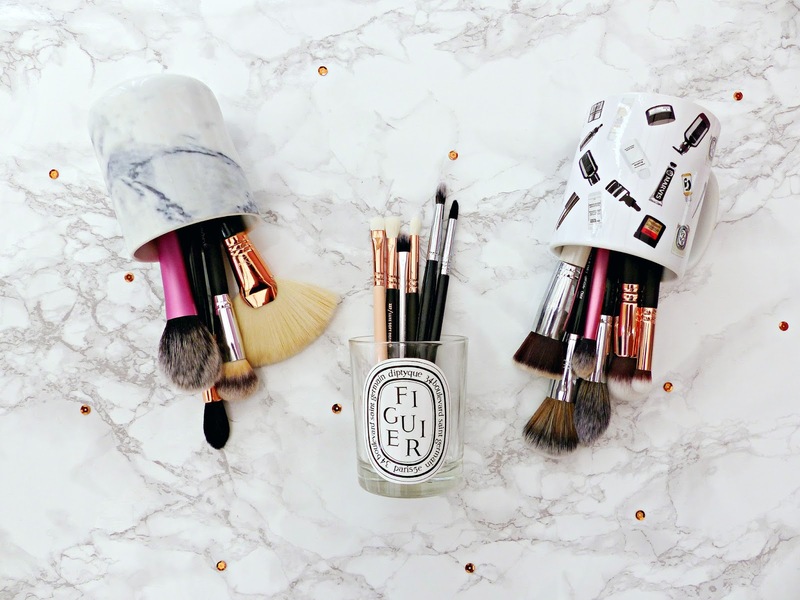 Love your brush cups!!! and your pics are amazing!! The Real Techniques setting brush is one of my favourites! Loved the post, very helpful. I want me some Zoeva :( No way to get it, I have shell double the price plus shipping. I loved reading this post! I don't use many brushes for my makeup - I love using a beauty blender for my foundation! I do really like urban decays eyeshadow brushes though! The RT base shadow brush is my favourite for applying eyeshadows too! I have 2 but they are both looking ropey so I could do with buying another set for a new one! I love my Zoeva Rose Gold set. Zoeva is still on the top of my wishlist, they look and sound amazing! Morphe brushes are so nice. I cant believe how affordable they are. I love the real techniques blusher brush and setting brush. They are so fluffy! Real Techniques are my favourite for face makeup brushes, so soft and clean up well too. I really want to try the Zoeva makeup brushes! I thought of purchasing Morphe brushes an then I came across Stephanie Nicole Youtube video on the brand and I'm glad I didn't purchase anything from them. You should watch the video if you get the chance, it's very informative. My favourite highlighting brush is Wayne Goss 03 brush, it's blends a cheap highlighter into looking like it's a $100.00. Amazing brush, love your collection here! Love these brushes! Looks amazing! 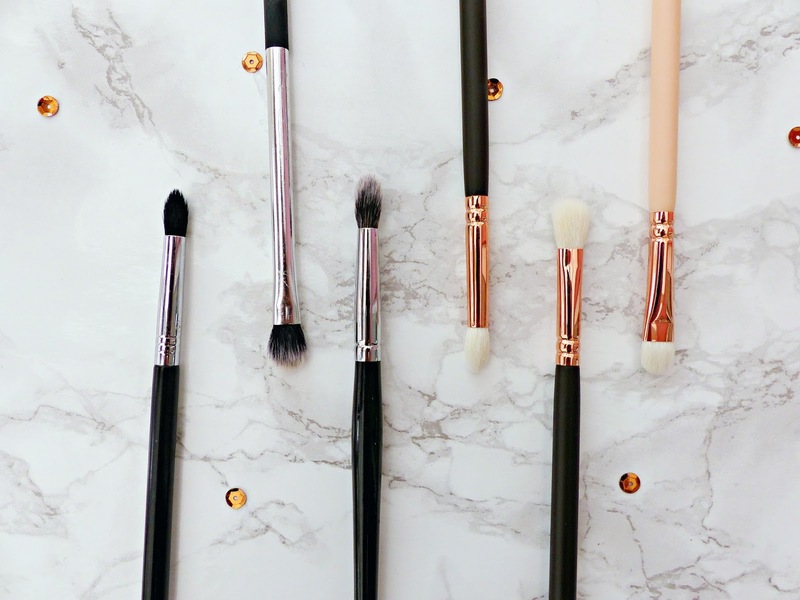 I'm still yet to add some Zoeva brushes to my collection but they always seem to receive such good reviews - I'm tempted to treat myself to the rose gold collection! On a budget I personally love Topshop brushes for my base, they surprisingly work so well and leave me with a very natural looking skin finish! I love my RT blush and powder brushes. I wasn't overly impressed with their Bold Metals collection, it seemed to be a lot of hype over nothing in particular and I regret spending that much money on them. Think I'll try the Nanshy Flawless Foundation Kabuki Brush next. That real techniques setting brush is one of my favourites. I use it for concealer, powder, contour and highlighting sometimes, I love that it's so versatile! Also, I love that mug in your first picture (right hand side) Where is it from? Oooh, you've got such an enviable brush collection! I must admit, on most days I mostly rely on my beautyblender. Some of these brushes are so tempting though, like that Sigma fan brush! Wow, great selection!! I have a lot of the same ones (especially from Zoeva and Real Techniques) but I have yet to try Morphe, Crownbrush and Nanshy. I really wanna check out Zoeva brushes ASAP!